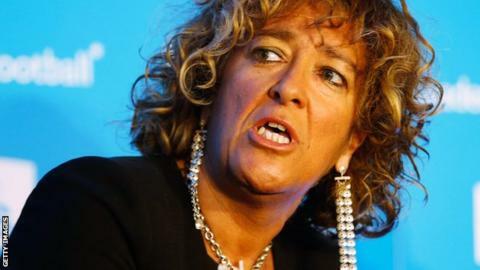 The Football Association's independent board member Heather Rabbatts is to be investigated for an alleged breach of its code of conduct. Rabbatts was critical of the FA's handling of former Chelsea doctor Eva Carneiro, who left the club after criticism from manager Jose Mourinho. Two members of the FA's council have called for an investigation into Rabbatts' comments. Women in Football said they were "staggered" by the developments. If any wrongdoing is found, Rabbatts could be removed from the FA board. A statement from Women in Football - a professional network for women in the sport - added: "Rather than seeking sanctions against Rabbatts, we would like to see the FA Council supporting her mission to shore up football's moral compass. "The fact that Rabbatts, as the only female and only ethnic minority member of the FA board, was alone in posing those important questions further underlines the case for why greater diversity is so very necessary across every level of the game. "That Rabbatts is willing to use her platform and speak out against injustice in the game should be welcomed by her colleagues, not condemned." FA chairman Greg Dyke is reported to have told the FA Council in a letter that he had supported previous strong statements by Rabbatts on the Carneiro case, and that he believed Mourinho was guilty of "a failure of his personal judgement and public behaviour". Lord Herman Ouseley, the chairman of anti-racism group Kick It Out who himself resigned from the FA Council three years ago, has called the decision to investigate "bizarre" and feels Rabbatts should be backed. "It shows what an antiquated body the FA Council is," said Ouseley. "As the only female independent board member, she is in an exposed position but she is there to provide a different voice and serve as a figurehead for people in the game who feel the whole system is against them." Under FA rules, only two members of the 121-person council are required for a formal investigation to be launched. Life vice-president Ron Barston and law lecturer Richard Tur are reported to have made the complaint. At the time of Carneiro's departure, Rabbatts was vocal in her support of the doctor, whom she said acted "properly". "Her departure raises a serious question on how players are safeguarded if their medical support is compromised," she said at the time. "The footage of the abuse she has endured in silence from the stands during her career is something we should all be ashamed of."